Click-Bang got hooked on SASS by visiting River Bend Rough Rider's January match in 2007. That afternoon he bought his first (of many) Cowboy guns, a Stainless Steel Vaquero...and it was all down hill from there...as far as the bank account goes. Click Joined SASS that afternoon. He shot his first match in Febuary 2007 and was in love. Soon he joined Doc Holiday's, South River Shootists and Cherokee Cowboys. 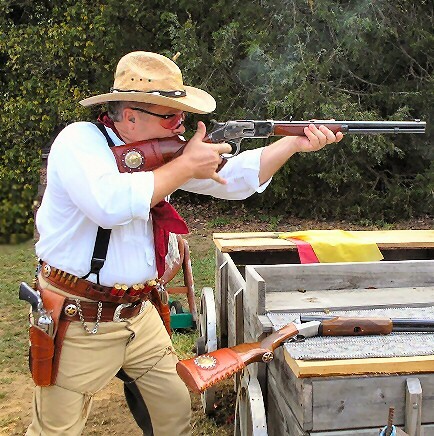 Click-Bang started out shooting Traditional and soon aged into a 49er where he lives today. "This is the funnest thing I've EVER done". "Every Cowboy and Cowgirl welcome you with open arms, like long lost friends." Click won The spirit of the game award in 2008 at Alabama State Championship at Ambush. It's his most prized trophy to date, since it was voted on by his fellow posse members. Shake a Howdy when you see Click-Bang !!!! !